If you look around on the Internet, you will see a number of sites on health. This is great but a lot of them are commercially driven and the text is interspersed with lot's of advertising. 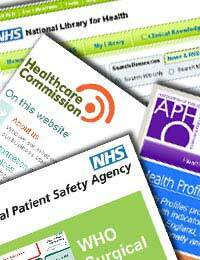 Here are a few useful National Health Service sites, which provide useful information and contact information. They are a valuable resource because the information is reliable and informative, based on government legislation and research. This "watchdog" site keeps an eye on the performance of the NHS and other independent health groups throughout England and Wales. The site provides NHS Trust ratings and if you want to obtain a report or look for publications on health you can obtain them here. It also has the results of surveys which make interesting reading. The aim is to help improve health services throughout England and Wales, and highlight problems areas or Trusts who are not performing as they should be. This association is a useful resource for health professionals and the general public. It covers the whole of the UK. The objective of the site is to promote best practice and support any health initiatives. It was created following a white paper, "Saving lives: our healthier nation". Reports can be obtained for example such as "New technique can target accurately identify the causes behind gaps in life expectancy between rich and poor". If you currently work for the NHS or are a patient then this site is for you, if you are interested in the latest health trends. The resources are very high quality and they have a number of specialist library collections in their armory, including a great number of web resources for different professions in the NHS. If you have an imminent interview coming up for an NHS position then give yourself a lift by quoting from one of the NHS papers at your interview! This site does what it says on the tin, in that it is concerned with the care of NHS patients. Any issues you have with your relatives not being cared for properly can be investigated with this agency. They investigate incidents and "near misses" in patient care, as sometimes happens, unfortunately either by accident or design. The NHS homepage is provided as a resource for the general public in the UK. It is an informative site where you can obtain medical advice, information about NHS services and a whole host of other NHS related topics. It is mainly intended for the general public, as opposed to health professionals. This site is similar to the NHS homepage site, in that it is a useful resource for the general public, but it also contains a number of interesting and informative articles on the subject of health issues, such as "Cold and flu advice". It also provides a list of useful resources enabling you to diagnose a number of medical conditions. This is a very useful site to consult if you have a health problem and you would like to know more about the condition, and ways to alleviate the symptoms.